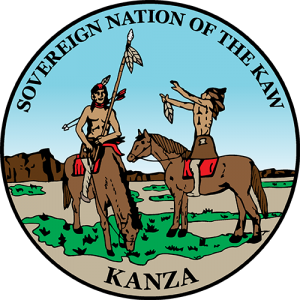 Kaw Nation Formerly known as the Kanza (or Kansa) people, the Kaws are a federally recognized Indian tribe officially known as the Kaw Nation. Presently, there are 3,460 enrolled members who, under a legal agreement with the United States Department of Interior, conduct tribal business from their tribal headquarters at Kaw City in northern Oklahoma. Historians and ethno historians have determined that the Kaw, Osage, Ponca, Omaha, and Quapaw lived together as one people in the lower Ohio valley prior to the white invasion of North American in the late 15th century. Sometime prior to about 1750, the search for better sources of game and pressure from the more powerful Natives to the east prompted a westward migration to the mouth of the Ohio River. The Kaw, along with the Osage, Ponca, and Omaha moved to the mouth of the Missouri near present-day St. Louis, up to the mouth of the Osage River, where another division took place. As a result of this division the Kaws assumed control of the region in and around present-day Kansas City as well as the Kansas River Valley to the west. By the mid-18th century, the Kaw were in possession of most of present-day northern and eastern Kansas. As a consequence of the white man’s diseases, their population had been reduced perhaps to less than 50 percent. Even so, the Kaws presented a formidable obstacle to American expansion into the trans-Missouri West. The Kaw warriors maintained control of the lower Kansas valley against both the white man from the east and alien tribes to the west. Beginning in 1825, formalized by the Indian Removal Act of 1830 the federal government forcibly transplanted nearly 100,000 people from various places onto lands claimed by the Kaw and Osage. This action required Kaws to sign treaties whereby vast acreage was ceded to the government. The first and perhaps most devastating Kaw treaty was negotiated in 1825 when then Kaws agreed to a reduction of their 20 million-acre domain, to a 2 million-acre reservation. Life for the Kaws between 1825 and 1846 was anything but easy. Poverty-stricken by the failure of the 1825 treaty and weakened by continuous government pressure for yet another land cession the Kaw leadership went to the treaty table again in 1846. The 1846 treaty required the sale of the 2 million-acre reservation to the government for just over 10 cents an acre. Eventually. the U.S. government began talking about a complete removal of the tribe from Kansas. The consequent Kaw treaty of 1859 allowed the tribe to keep only 80,000 acres of the poorest land, to be subdivided into 40-acre plots for each family which was wholly insufficient to support one Kaw family. By the late 1860s the government was obliged to authorize emergency funds to prevent outright starvation of the Kaw people. Finally, in 1872 a federal act was passed providing for the removal of the Kaws from Kansas to present-day northern Kay County, Oklahoma, which was carved out of former Osage land. Today Kaw Nation is again a proud and prosperous Nation. Their Business Services (KNBS) activities include several businesses located throughout Kay County. The Kaw Nation Headquarters also oversees the Kaw Housing Project, Kanza Health Clinic, Kanza Wellness Center, Kaw Nation Police Department, Kaw Nation Emergency Management, Kaw Nation Judicial Branch, Kaw Nation Environmental Department, Kanza Language Department, Kanza Museum, Kanza News, Kaw Nation School Age Enrichment Center, Child Support Services, Social Services and Academic Scholarships, Library and Learning Center, Title VI Lunch Program, and is a member of the Chilocco Development Authority. The Kaw Nation tribal headquarter is in Kaw City, Oklahoma. The traditional language of the Kanza people is Kaánze Íe, or simply Kanza. Although it is a separate language, it is closely related to the languages of the Osage, Ponca, Omaha, and Quapaw tribes. Kanza is a Siouan language, and so it also has similarities in grammar and vocabulary with Ioway, Otoe-Missouria, the languages of the Sioux peoples, as well as more distant ties to Crow, Mandan, Hidatsa, Biloxi, and others. During a long and very devastating period in the history of the tribe, usage of the language began to taper off dramatically. This trend continued on into the twentieth century, until only a handful of the fullboods in the 1970s could speak the language fluently. Today, all these elders are gone. The Kanza people today speak English as a first language, but many can still understand and use Kanza words and phrases. The Kaw Nation is interested both in preserving the language and more importantly in reviving it. The Kanza Language Project is a special department of the tribal operation devoted to this task. For a wealth of information about Kanza and a wide range of user-friendly language resources, please visit WebKanza, the homepage of the Kanza Language Project. Kaw Nation owns the Kanza Travel Plaza; Woodridge Market; Smoke Shop I, and II; SouthWind Casino; including a bingo hall, and an off-track wagering facility; and SouthWind Casino Braman, Which opened September of 2014. The estimated annual economic impact of the tribe is $200 million.